First, an enthusiastic thank you to everyone who made it out to the 2015 Alumni Regatta! We had very high participation from current team members and alumni alike—see below for Bill Edwards’ more detailed synopsis of the weekend. This year, the team aims to purchase either two gently used practice boats or one brand new racing boat. We’ll provide updates on their progress towards that goal over the next year. On that note, if you are new to FOUST or didn’t get a chance to renew your FOUST membership, you can do that and/or donate here. I’m also happy to announce our new FOUST officers for the year. Neha Bazaj will return as our trusty treasurer. Sam Wheeler and myself resume our alternating posts as president and vice president, respectively, and Erica Parker and Louise Lehman will co-serve as secretary. Finally, graduating senior Kimberly Alcorn will serve as team liaison. The team has also elected their new officers, carrying on a tradition I’m particularly proud of—female leadership! Senior Kylie Sullivan and junior Sarah Wyman will serve as co-captains. Congratulations, ladies! This year, some of our goals for FOUST are to provide more frequent but shorter email updates, make some cool swag for purchase, get more alumni and friends involved, and of course, raise plenty of cold hard cash for the team. Thanks to Bill for contributing most of this epic recap. 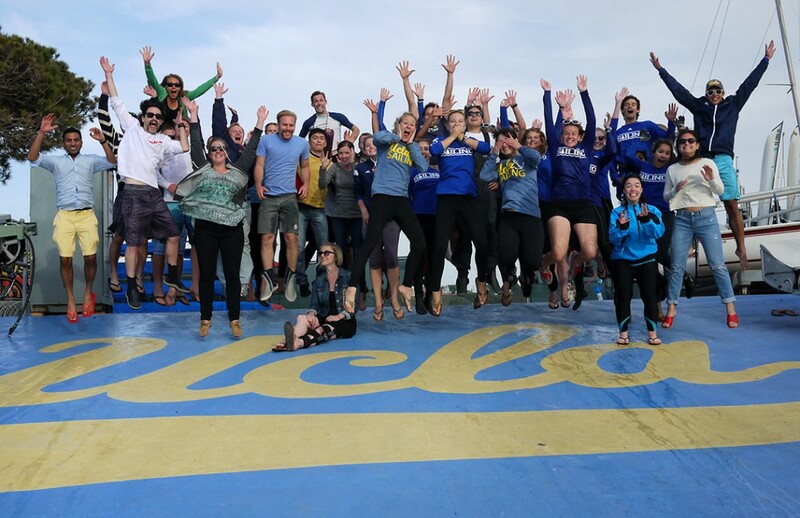 With over 50 attendees participating in twenty races, the 2015 UCLA Sailing Team Alumni Regatta was a screaming success. Current team members, alumni, and friends converged on our old home turf at the Marina Aquatic Center, hailing from as far as the east coast. For the day, we were transported back to any one of the countless afternoons we spent sailing an FJ with our best friends, sun on our back, breeze on our shoulder. Some of us even got to wander around with absurd facial hair! A compilation of photos from the event can be found here. The day began with fleet racing under a steady 7-knot breeze. With sailors rotating in and out of boats after every couple races, the Race Committee ran 10 races. This year, we implemented a four race minimum for award consideration to address a crafty tradition of sailing only one race and then sneaking off to keep averages high (I’m lookin’ at you Oscar!). Sarah Macpherson (UCLA ’18), Emelia Pelliccio (UCLA 13’), and Judge Ryan put together four flawless races and were proclaimed the winners. For the first year ever, the day’s winners received UCLA Sailing First Place trophy pint glasses, provided by Vlad Mikulich (big thanks for his continuing support of the sailing team!). While many people helped to organize races and get people off the docks, current Sailing Team Captain Kylie Sullivan (UCLA ’16) also deserves a huge thank you for managing the race committee boat and making sure that we always had a top notch course. While we were exceptionally pleased with the turn-out at the event this year, we greatly missed those who couldn’t make it. To those who who planned to attend but couldn’t due to personal emergencies, our thoughts are with you we’re all to sending good vibes your direction. Those of you slackers that didn’t make it for less legitimate reasons, get your act together next year! We want to see you! Following tradition, over 30 regatta participants converged at the Schweglers’ lovely home in Long Beach, where much food and drinks were had, along with the annual alumni wrestling match and the second annual Three Man competition. Many thanks to the Schweglers for another memorable evening. Check out this photo album featuring shots from Bill and Harsh Shah! Also check out this great video of the afternoon from graduating senior Kieran Hashmi! Team members and alumni on the UCLA boat at the Course Crosiere EDHEC in France. From left: Oscar Jasklowski ('11), Gabe Monti ('15), Erica Parker ('14), Justina Leo ('15), Allison Skager ('15), Billy Edwards ('12). Photo credit: Morgan Glier ('11). In this issue, we have a Notice of Race for the Alumni Regatta, spring regatta results including Coed and Women’s PCCs, and a quick recap of the Course Crosiere EDHEC - UCLA’s annual voyage to France for a major European college keelboat regatta. We’re hoping to see all of you at the Alumni Regatta on Sunday, May 26 (Memorial Day weekend). If you RSVP on facebook or send us an email, we’ll be sure to have food for you. This will be the fifth year of the present incarnation of the alumni regatta so let’s make it the best yet! Emelia Pelliccio ('13) and Erica Parker ('14) debut UCLA's BRAND NEW FJ at South 3 in Newport. We’ve been slacking lately at FOUST, but we’re back! With big news! See below for announcements about the Alumni Regatta (we have a date! ), a NEW BOAT, and fundraising success. This issue includes regatta results for the first couple months of 2013 and a preview of what to look forward to for the rest of the spring, including the annual France trip. Photo credit goes to Nora Brackbill (’13) for the action shots from South 3. We’re trying something new with this issue: you can click through most of the photos to higher resolution versions. This is something we want to keep working on in the coming months. Low wind at Tomales Bay, where a number of UCLA alumni competed in the Vanguard 15 Fleet 53 championships. Kevin Richards ('00) and Neha Bazaj ('10) finished second of fifteen boats. 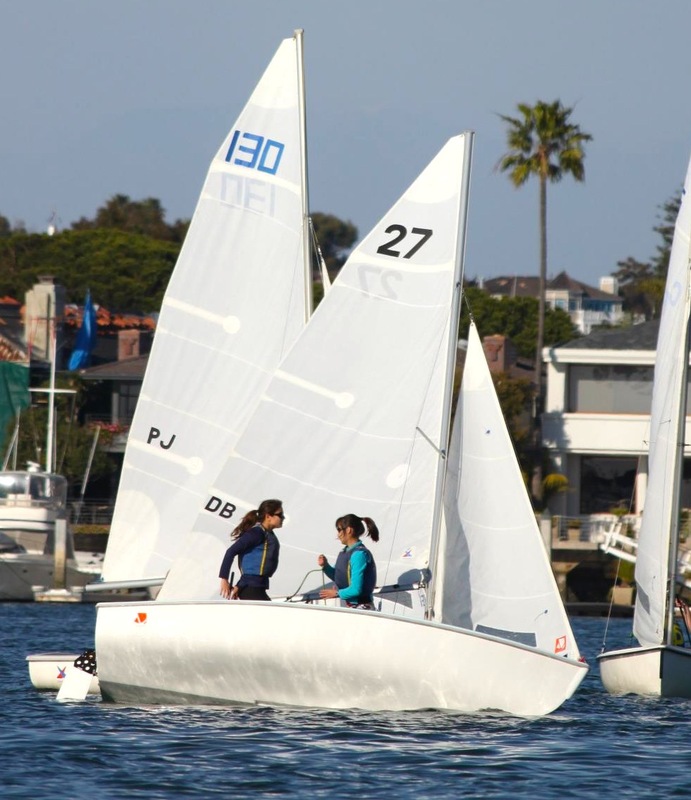 Another year of UCLA sailing has started, and the team has already competed in four regattas. We’ve got results for you below. They’ve also had a great start recruiting, with 25 new sailors showing up for the initial recruiting event and around 18 staying involved so far. The roster was starting to get a little low last year, but with only one graduate departing last spring and a good turnout this fall, the future of the team looks as bright as ever. The team shifted to a new practice schedule this fall, getting on the water on Tuesdays, Wednesdays, and Fridays. Considering the number of Monday practices that got cancelled when people were worn out from regatta weekends, I wish we had thought of that while I was there. Instead of sailing on Mondays, they’ve been holding chalk talks in Westwood to help get the new recruits up to speed. So far, these have been well attended by new and returning members alike. 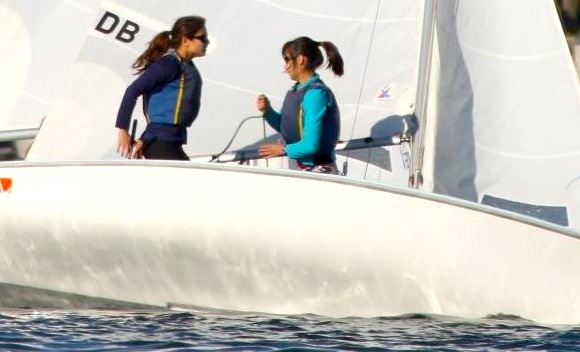 In addition to regatta results, we’ve also got some updates on alumni sailing activities, including dinghy racing, distance sailing, and a pirate festival. These newsletters often include a request for donations to the team. Right now, though, there are significantly greater needs. Please do what you can to help with the recovery from Hurricane Sandy, whether that’s donating money to the Red Cross, giving blood, or if you’re in the affected areas, volunteering. Don’t worry, we’ll get back to hitting you up for money for the team soon enough. For now, we hope that any members of the FOUST community who are on the east coast are staying safe. 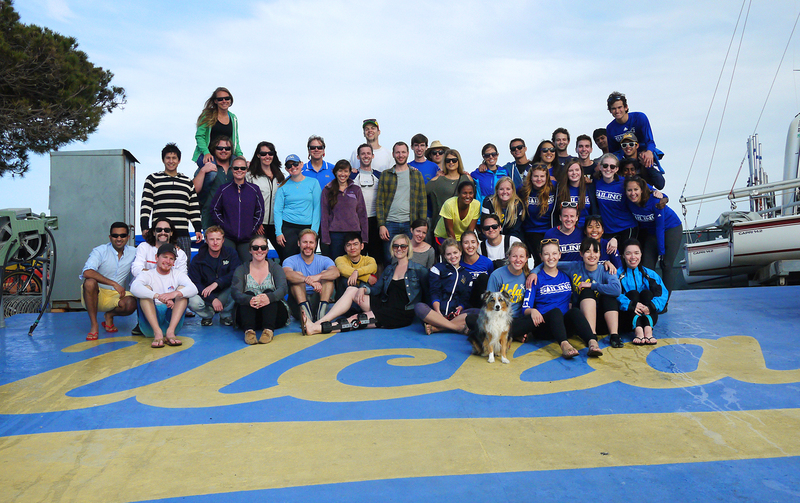 © 2011 Friends of the UCLA Sailing Team.